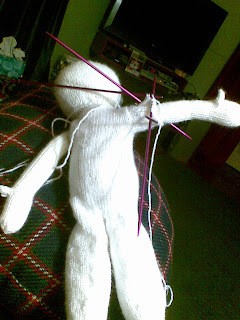 The last week has only proven to me that people who say that "Knitting is the New Yoga" are vastly deluded. I was up until 2:30 am Saturday morning trying to meet the deadline for the the 2009 Sydney Royal Arts Show aka The Easter Show. I made it but it was not a pleasant experience. 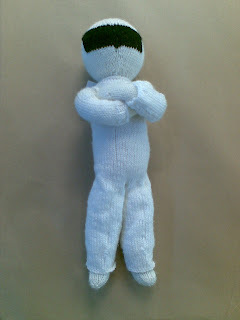 My entry was a version of The Stig base roughly on a Knitty pattern with adaptations for the overalls and helmet. I was knitting in the round with anodised aluminium DPN, acrylic/viscose yarn and slightly damp hands due to the humidity and my stress. It was not a smooth process of repetitious movements generating alpha waves of contentment but a sticky, erratic, jerky process punctuated with muttering, cursing and cries of pain as I jabbed myself. I made the deadline and Stig is now sharing a display cabinet with cute clowns, fluffy ducks and teddy bears. I trust he will remain unfazed throughout this experience while I, on the other hand am definitely in need of rehabilitation. The Stig! Drool, everyone loves the Stig! He looks great Kate. (and I loved Captain Underpants last year too). See you at the preview? That's too cool for words. I went to see Top Gear Live a couple of months ago and it was fantastic! Awesome! Somehow I don't associate the Stig with alpha waves of calm. The Stig will, as ever, remain unfazed. I just hope there are no toy cars within reach! I found knitting DD's stole for the wedding to be "not a smooth process of repetitious movements generating alpha waves of contentment but a sticky, erratic, ... process punctuated with muttering [and] cursing" at times. BTW, good luck to The Stig! Love it love it love it Kate!!!! !